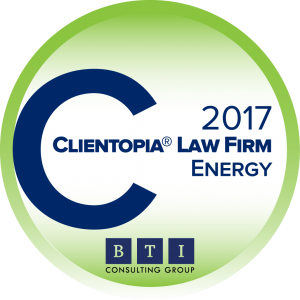 BTI research reveals 17 law firms stand out with the strongest relationships—who are both core and recommended first in the Energy industry. GableGotwals was recently featured in the BTI Industry Power Rankings 2017 along with several other nationally recognized firms. BTI Power Rankings 2017 is based solely on in-depth telephone interviews with leading legal decision makers. This comprehensive analysis of client relationships trends data from more than 4,000 corporate counsel client interviews conducted over the span of 17 years. This research is independent and unbiased—no law firm or organization other than BTI sponsors this study. Each year, BTI reaches out to a sample of legal decision makers at large organizations with $1 billion or more in revenue. BTI Power Rankings 2017 includes insights from BTI’s 17-year ongoing study with General Counsels and legal decision makers. Participants are granted confidentiality at the individual and organizational level.